Drummer Øyvind Skarbø’s trio Bly de Blyant, comprised of the Icelandic guitarist Hilmar Jensson (TYFT, Jim Black’s AlasNoAxis) and the Brooklyn-based multi-instrumentalist Shahzad Ismaily (Marc Ribot, Will Oldham, John Zorn) in addition to Skarbø, received glowing reviews for their adventurous debut album ABC. The British magazine Prog wrote: “It’s a highly subtle album that denies itself nothing in terms of its sonic palette.” Rock-a-Rolla described the album as “[a]n intriguing, shapeshifting collection, open-ended and saturated with potential”. “We had so much fun recording ABC,” says drummer Øyvind Skarbø, “that we wanted to try a similar formula for the new record.” Hindsight Bias was recorded in the same studio (Grieghallen Studio in Bergen, now closed) with the same technician, Davide Bertolini. This time, too, the three musicians were together in the same room, without headphones, and with a wide variety of analogue instruments and equipment to play around with. One important point of similarity between ABC and Hindsight Bias is the unprejudiced attitude towards mixing and drawing inspiration from different genres. The members of the trio find references everywhere, and seem capable of combining them in an entirely uninhibited manner. The main difference between the two releases lies in the material. ABC was a rather fragmented record, presenting a large number of short pieces. Many of them were based on small sketches, and a good deal of the album was improvised in the studio. Despite their broad-minded eclecticism, the band manage to maintain credibility in everything they do, whether it is prog-inspired rock (“Michael Jackson Pollock”), groovy, twisted instrumental soul (“Westkreuz”), or disco with a banjo (“Laura”). This is a band that feels at home no matter which musical impulse they choose to pursue. Bly de Blyant er en trio som opererer over hele jazzpaletten – og vel så det. Jeg får meg ikke til å bruke BLy de Blyants frenetiske sjangerblanding mot dem… Det er så man allerede gleder seg til hva neste album kan bringe. Det tenker jeg er et godt tegn. Du verden hvor flott det låter…Innfallsrik og funky jazzrock med twang og åpning i alle retninger. Fellesnevner: full fordomsfrihet i innstillingen til musikkutøvelse. Resultat: boblende kreativt samspill som fyller låtstrukturene med delikat godlyd. There is never a dull moment and it´s all over way too soon as seems to be the Hubro style, but better that than too few ideas dragged out over too many tracks…Anyone with an interest in the intersection of rock and jazz should find this an intriguing release. Owing as much to Miles Davis as they do to Faust, Bly De Blyant seem to wilfully defy definition, and in doing so they establish their own stylistic parameters. It’s not that they are subverting genre, nor that they are unaware of its limit, but that they know exactly how to step beyond them while retaining their footing. This second album from the multiinstrumental trio of Shahzad Ismaily, Hilmar Jensson and Øyvind Skarbø veers from the melancholic AOR of Jiddy to the avant rhythm´n´blues of Westkreutz and then into Earth, Wind & Fire prog-funk with Laura. That´s just the first three tracks. Later on there´s math-metal on Michael Jackson Pollock and banjo-driven country rock on Bunker Hill. Bly De Blyant are impossible to nail down and deliriously enjoyable. Such stylistic promiscuity might imply a flippant eclectism; but the trio synthesise their inputs without compromising their individuality. Hilmar Jensson (guitar), Shahazad Ismaily (bass) and Øyvind Skarbø (drums) are tremendously capable musicians with a soulfulness often lacking from ensembles of their ilk. 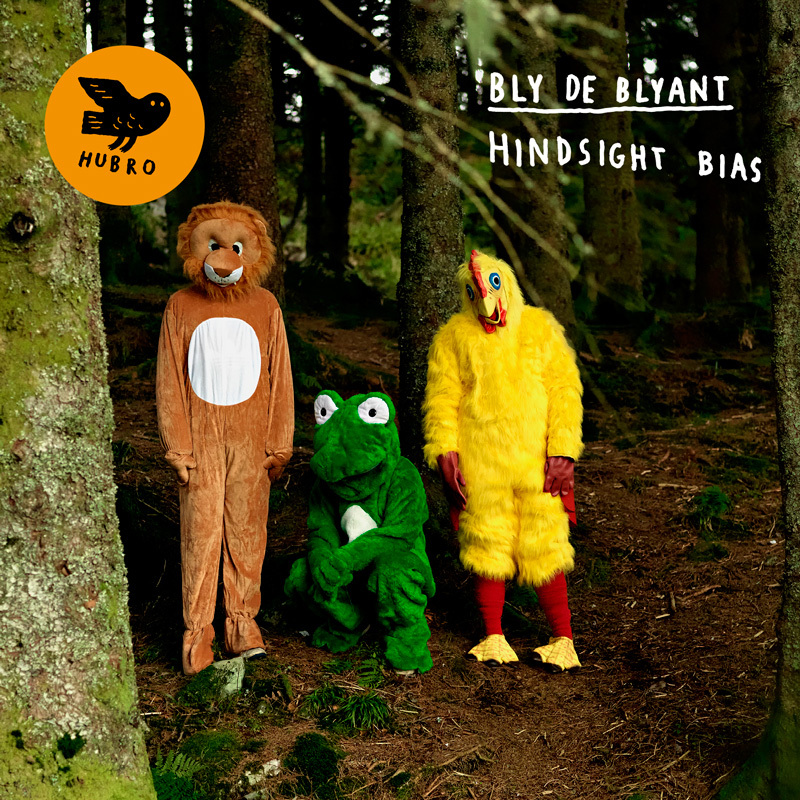 Hindsight Bias is Bly De Blyant´s fines release to date, and their brilliance also stands as testament to the unerring discriminiation of their label. To give some ide of the eclecticism that can be found on Bly De Blyant´s second LP, one band member, Shahzad Ismaily, is listed as playing instruments as varied as bass, Moog, organ, banjo and drum machine. The Icelandic-Brooklyn trio takes a similarly broad approach to the genres they pursue. Alongside the straightforward dance groove (with banjo) of “Laura” you get the ghostly electronic experimentalism of “Hindsight Bias” or the disjointed rock of “Michael Jackson Pollock”, as the album veers from becalming soulful jazz to arresting dissonance before ending on a bluegrass note with the splendid romp “The Eighteen Irascibles”. It’s a warm release; not only for the fluid and courteous communication between the three musicians, but for the vibrations that emanate from the piping glow of amplifier valves, each speaker gently resonating the grill of the other. Such an attention to space and production places me right in the midst of the knowing smiles and synthesiser lights, watching the walls fall down as the velvet-curtained club of “Laura” (an elasticated bass hook that offers up a good half-hour’s of jamming potential, from which the band modestly claim a punchy three minutes) turns into the vast and wayward space of the title track, seemingly recorded in a corner café that yawns outward into a pristine, high-ceiling shopping centre: guitars and organs humming softly in the midst of lunchtime chatter and plates chinking on wooden tables. Muzyka Bly de Blyant jest wyśmienitym dowodem na to, że można bez trudu przemieszczać się po różnych estetykach, łączyć je, wywracać do góry nogami, a przy tym pozostać sobą. Artyści z dużą lekkością przemycają do swoich kompozycji elementy muzycznej zabawy, eksperymentując z dźwiękiem i frazą. Twórczość Bly de Blyant bez najmniejszego trudu odkleja się od jednoznacznych podziałów czy skojarzeń. Myślę, że na „Hindsight Bias” muzycy nie pokazali jeszcze całego arsenału swoich możliwości, choć już na tym etapie udało im się nasycić moją muzyczną ciekawość. Nagrania Bly de Blyant zadowolą wszystkożernych połykaczy dźwięków. Laura has a three-chord guitar riff worthy of Nile Rodgers, alongside which Ismaily improvises on singing Moog; Michael Jackson Pollock speaks for itself, with a frantic dancing aspect to some splattering guitar, drums and electronics. At the more abstract end of the band’s creations is the title track, which includes found sounds of jangling keys and distant conference noises as well as a slow stately tune played by Jensson. Bunker Hill features marvellous lumpy drumming and a powerful solo from guest saxophonist Kjetil Møster. There are also two freely improvised tracks, the second of which, The Eighteen Irascibles, has chiming banjo and a groove which reminds me of David Crosby’s ’70s solo album. Of this band, Skarbø says on his website: “We start off playing compositions heavy on jazz information, and end up improvising strange rock.” I like that. Überraschung gelungen, Band als solche etabliert – BLY DE BLYANT dürfen sich jetzt als ernstzunehmende Combo zwischen Jazz, Post Rock und Hastunichgesehen betrachten, die beweist, dass zwanghafter Regelbruch doch hörbar sein kann, wenn man ihn mit Respekt vor den Komponenten angeht. „With „Hindsight Bias” I wanted to create a more integrated album, with fewer and more concise songs”. Recht so, Øyvind Skarbø, denn wir erinnern uns: Der Vorgänger „ABC” verlangte vom Hörer doch schon ein gewisses Maß an Hör-Toleranz. Die neuen Tracks sind in der Tat wesentlich homogener und liegen weitaus angenehmer im Ohr. Gitarrist Hilmar Jensson hat sich deutlich mehr vom Nordic-Rock inspirieren lassen und klingt jetzt wie eine großzügige Mischung aus Terje Rypdal und Eivind Aarset. Drummer Skarbø rumpelt dazu in bester Alter­native-Manier und Bassist Ismaily umklammert alles mit seinen pakistanisch-skandinavischen Tieftönen. Und obwohl alle acht Stücke aus der bereits bekannten Session des „ABC“-Albums stammen und auch die Crew identisch ist, sind sie doch grundlegend anders. Die Beats laufen durch, die Improvisationen orientieren sich an Progrock, Alternative und, man höre und staune, an Disko. Der Titel „Laura” beispielsweise basiert auf einer dem Drummer im Traum erschienenen Bassline und hat angeblich was von James Brown. Der Song wurde dann auf einem analogen Kassettengerät aufgenommen und hinterher mit ProTools neu frisiert, geht somit als sehr funky durch. Mit diesen Stücken im Angebot haben sich Bly de Blyant wieder Pop-mäßig geerdet. Experimente sind ja manchmal schön gut und vielleicht auch ganz nützlich. Aber konkrete Musik macht eben doch mehr Spaß. Zumindest für den Zuhörer. Øyvind Skarbø, Hilmar Jensson und Shahzad Ismaily hat das Zusammenspiel bei ABC (Hubro, 2013) so gut gefallen, dass sie Lust bekamen, BLY DE BLYANT fortzusetzen. Hindsight Bias (HUBROCD2539) ist das Resultat, acht Instrumentals – mit Skarbøs Drumming, Jensson an der Gitarre und Ismaily an Bass, Moog, Georgel und Banjo – die weniger sprunghaft daher kommen wie das ideenreiche, aber skizzenhafte Debut. Jenssons singende Gitarre spielt die Hauptrolle bei ‘Jiddu’, bei ‘Westkreuz’ interagiert sie besinnlich mit der Orgel, bis Moog und Keys mit energischerem Schritt im Berliner S-Bahnhof umsteigen. Bei ‘Laura’ jingelt Jensson hell und funky zum steten, vom Banjo verstärkten Auf und Ab des Basses, die Orgel pfeift und trillert eine lyrische Melodie. Das Titelstück beginnt mit geheimnisvollem Gestöber und Stimmengewirr im Hintergrund, die Gitarre zupft Trübsal, das Harmonium spinnt den Faden zu Ende. Mit gehämmerten, krummtaktigen Stakkatos scheint ‘Michael Jackson Pollock’ andere Saiten aufzuziehen, aber Jenssons starkes ‘Multiform’-Solo dazu ist getragen und erhaben. Ein schneller Morsepuls treibt das improvisierte ‘DEFGHIJKL’ voran, die Orgel trillert dazu wie ein Dudelsack. Knurrig, mit hinkenden Beats, flirrendem Georgel und aufrauschenden Becken wird ‘Bunker Hill’ inszeniert, aber wenn keiner der drei das aufflammende Tenorsaxsolo bläst, wer dann? Anwort: Kjetil Møster! Mit einem Banjoloop bestimmt Ismaily zuletzt den Ochsentrott von ‘The Eighteen Irascibles’, der zweiten Improvisation des Albums. Auch am Lagerfeuer schürt er die Träume von einer baldigen Ankunft im Gelobten Land. Im Traum geht der Trott (auf Pianohufen) schneller dem Ziel entgegen, die Orgel zieht als Wolke voran zu den grünen Weiden für die Irascible18, jene Abstrakten Expressionisten, die sich 1950 für Life als Gruppe von Bankern ablichten ließen, um ihren Anteil an Fame ‘n’ Fortune einzufordern. Bekanntlich erfolgreich. Die drei Viecher auf dem Cover übrigens, die sind aus Magnus Fra Garden ausgebüchst. Ostensibly a guitar-bass-drums outfit led by drummer Øyvind Skarbø and featuring Brooklyn-based multi-instrumentalist Shahzad Ismaily and Icelandic guitarist Hilmar Jensson, Bly de Blyant brings a refreshingly free-spirited and playful vibe to its thirty-four-minute follow-up to its ABC debut. A number of genre bases are covered in the eight pieces, all concise and free of excess, and the group’s playing is tight, unfussy, and live-sounding. Bly de Blyant is a trio comprised of Norwegian drummer Oyvind Skarbo, Icelandic guitarist Hilmar Jensson and Brooklyn-based multi-instrumentalist Shahzad Ismaily. Here with their follow-up to their previous album, also on Hubro, ‘ABC’ . Again they show many different faces you see not often combined in one work. The keyboards in the disco-track ‘Laura’ and in ‘Westkreuz’ reminded me of Bo Hansson and Tonto. Anyway it smells strongly of the 70s. ‘DEFGHIJKL’ is a hypnotizing and pulsating track. The title track starts as a improvised soundscape, before it halfway turns into a slow and introspective piece, with sparse motives played by guitar and accordion. The first part of the closing track is a kind of ragarock clearly referring to Popol Vuh. Halfway the piece turns into a meditative and open space that in no way refers to the first part. It is for these strange and unusual breaks and twists that I like this album most. They play with expectations and create a pleasant confusion. O que é que acontece a alguém que está dez dias a ouvir sempre o mesmo disco? Foi essa a experiência a que voluntariamente me submeti. Não porque pretenda concluir alguma coisa, mas porque o disco se impõe, pede para ser tocado. O trio Bly de Blyant, do baterista norueguês Øyvind Skarbø (que conheci através do trio 1982, uma coisa belíssima), integra a guitarra islandesa de Hilmar Jensson (Jim Black AlasNoAxis) e o multi-instrumentista americano Shahzad Ismaily (Marc Ribot, John Zorn). Pois acaba de lançar o seu segundo CD, “Hindsight Bias”, que toca uma música alegre, luminosa e muito melódica. Trioen Bly de Blyant med Hilmer Jensson (guitar+div), Øyvind Skarbø (trommer) og Shazad Ismaily (bas+div) har også lugtet til noget blues. Det er dirty og farligt. Det er foruroligende. Det er progrock, jazz og avantgarde. Der er disconummeret Laura der lyder som et outtake fra Daft Punk’s Random Access Memories komplet med Nile Rodgers guitar og fed bas. Der er The Eighteen Irascibles med banjocountrytoner og nummeret Michael Jackson Pollock’s progrock.